People ask us all the time where the name of Wake comes from. They often say we should be called sleep! But the name Wake comes from a very special person–or, not quite a person. Wake’s signature move was jumping into stranger’s cars it seemed. He would jump in the car of a stranger if you weren’t careful while taking him to a park or on a little jaunt somewhere. He just liked people, he really just liked everyone. Best veterinarians could assess he was part collie, part Rhodesian, and was as stubborn as the day was long. You could get so mad at him one minute and then realize he was just a big, soft lovie dog that just wanted to be around where all the action was. Wake weighed about 60 lbs or so but must have thought he was a chihuahua because he couldn’t get close enough to you. He was at his happiest when trying to inch his way onto your lap while you sat on the floor and played with him. If you were having a bad day, if you needed a buddy for a walk, or just someone to hear out your latest presentation then Wake was there for you. Wake, to us, was like many dogs you know. They treat us as we should really treat each other. They are kind to us, they comfort us, they are just there for us through thick and thin. No questions asked, never complaining, as loyal a friend as you will ever find. When it came time for us to name the business, I instantly gravitated towards Wake. 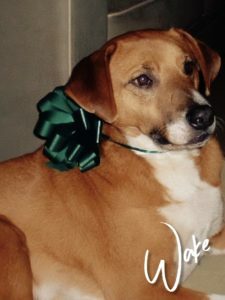 We wanted our foot sanctuary to embody Wake’s charm, his approachable nature, and his loving attitude towards all he met. When he passed in 2016, it was even more reason than ever to do right by his name and his legacy. We can only hope and try to be that great of a friend to our Wake guests and teammates. It’s worth working towards every day. “ – Melissa Long, Founder and CEO of Wake Foot Sanctuary.